This beautiful watch has been passed down from my grandma (now 98 years old) to my mom and now to me. I would like to know as much about the watch as possible as I would like to pass it on to my daughter later on. It has four diamonds on the front, two on top and two on bottom. I think it might be a "Lady Bulova" but definitely not an expert, so not sure. The movement symbol is the same for 1930 & 1940 so unsure of the year. I am curious about all of the markings on the inside of the backcase. Looking forward to hearing what you all have to say! Hello Ktpowell81, welcome to myBulova. I think heirloom watches are simply the best. You're most fortunate to have this wonderful keepsake to pass on to your own daughter. I think the date of your watch should be 1940, the date code 'omega' was used twice (1930 & 1940) but the style of your watch is definitely 1940. I've linked an advert here that will, I think show your watch to be the Goddess of Time model. Incidentally, the flying/dancing woman seen as the Bulova logo of the era was also called the "Goddess of Time"
Oops, almost forgot. All the marks you see inside the back of the case are markings made by the various watchmakers who have serviced the watch over the years. There really is no code to them as each 'maker has her/his own system of identifying what (and when) they've done to the watch. I call them 'love marks' as they testify that someone loved this watch enough to have it serviced. We recommend regular professional service for watches that will be used, it's an inexpensive way to keep it ready for the next owner. Depending on where you live we might be able to recommend someone. Mr. Baker, thank you so very much for you input and knowledge lended! Hope you have a great day! Welcome to myBulova! What a beautiful heirloom watch to pass down to your daughter! My grandmother's watch is what started my collecting. The Goddess of Time and Lady Bulova are very close. I am trying to find clear ads of both to figure out the differences, it might be the lug or the dial. 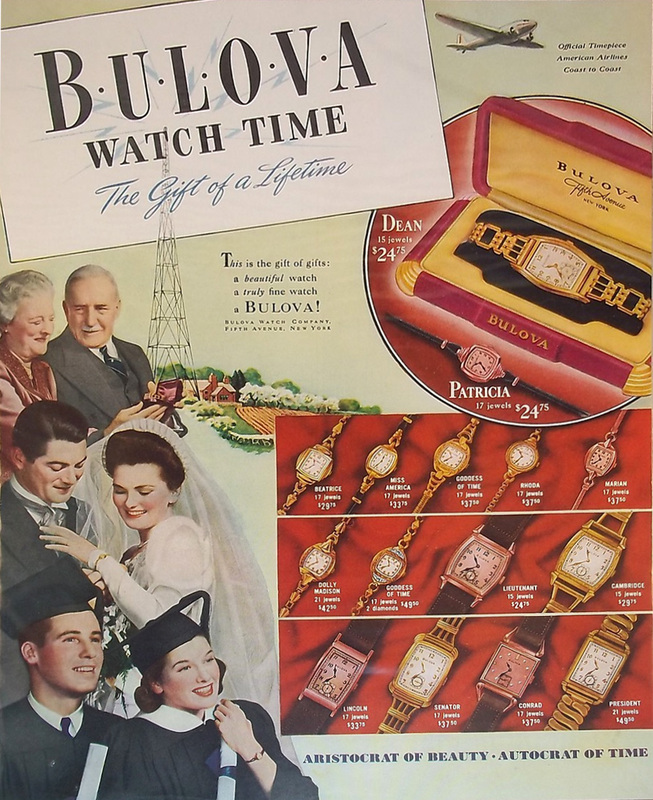 For now here is an ad for the Lady Bulova. The Morning News, Dec. 16, 1940 and The Evening Sun, Mar. 28, 1940. I am leaning toward Lady Bulova, I think the bottom ad shows the lugs best. Kathy! Thank you! This is perfect love having an add to show my daughter! Thank you again! Ktpowell81, I have the full ad if you want it. Feel free to message me your email if you want them. Oh, good catch Kathy, I didn't do a very good count on the Diamonds. Lady Bulova it is! It appears that the LB face sports even numbers and the Goddess of Time is fully numbered. Thank you all for your time and input, so happy to know what I have!